SASH offers Brainsway Deep Transcranial Magnetic Stimulation Therapy (dTMS Therapy). We are proud to be the first center in Central Texas to offer this ground breaking new therapy to those that suffer from Depression that has not responded to other treatment. Transcranial Magnetic Stimulation (dTMS) is a noninvasive technique used to apply brief magnetic pulses to the brain. The pulses are administered by passing high currents through an electromagnetic coil placed adjacent to a patient’s scalp. The pulses induce an electric field in the underlying brain tissue. When the induced field is above a certain threshold and is directed in an appropriate orientation relative to the brains’ neuronal pathways, the neurons in the relevant brain structure are activated. The Brainsway Deep TMS System is cleared by the Food and Drug Administration (FDA) for the treatment of depressive episodes in adult patients suffering from Major Depressive Disorder who failed to achieve satisfactory improvement with any number of antidepressants trials for the current episode of depression. What should I expect in a dTMS session? Deep TMS is a treatment prescribed by a physician, usually a psychiatrist. Treatments are administered by a Certified Technician. 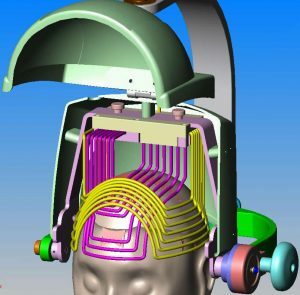 During the first dTMS treatment session, the technician will place the magnetic coil, which resembles a helmet, over the patient’s head. To calibrate the intensity of dTMS an individual patient requires, the technician will stimulate the region of the patient’s brain that makes the thumb move. Patients hear a clicking sound and feel a tapping sensation on the scalp. The device is adjusted to give just enough energy to send electromagnetic pulses into the brain, so that the thumb twitches. The intensity of stimulation that barely produces a movement is called the motor threshold (MT). Once the MT is determined, the magnetic coil will be moved to the location of the brain research suggests may be responsible for causing depression. How often a patient’s MT is re-evaluated is determined by the physician who prescribes the treatment. The treatment session is delivered as a series of pulses that last 2 seconds, with a rest period of 20 seconds between each pulse sequence, for a total of 1,980 pulses. Treatment is targeted to the region of the brain called the dorsolateral prefrontal cortex (DLPFC), or the left frontal part of the brain. Each treatment lasts approximately 20 minutes.The number of sessions required to treat each patient will be determined following a comprehensive evaluation with Dr. Winston or one of his associates. Daily sessions are conducted Monday through Friday, excluding holidays when our clinic is closed. Dr. Winston meets with each patient weekly, during the course of Deep TMS treatments, to answer questions and coordinate treatment. This treatment does not involve any anesthesia or sedation and patients remain awake and alert during each treatment. Patients are able to drive themselves to and from appointments. Throughout the course of treatment, patients are regularly evaluated by their healthcare provider. How are referring psychiatrists or healthcare providers involved in Deep TMS? 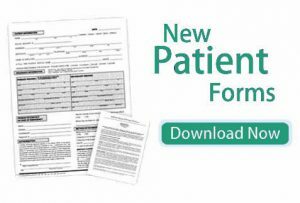 The Texas TMS Center works with referring psychiatrists and other healthcare providers to ensure open and efficient communication about patient progress in dTMS. Patients maintain their ongoing relationships with their current psychiatrist or healthcare provider, and our TMS coordinator ensures that all relevant information regarding patient treatment is sent directly to the referring healthcare provider in a timely manner. Once treatment is complete, our patients return for follow up care to their psychiatrist or other healthcare providers. Visit our website at Texas TMS Center for more information.